“To analyze the charms of flowers is like dissecting music; it is one of those things which it is far better to enjoy than to attempt to fully understand.” – Henry T. Tuckerman. 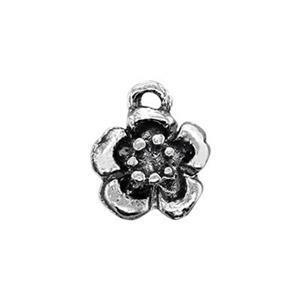 You’ll truly enjoy our S1094 – Cast Sterling Silver Flower Charm. Oxidized Antiqued to bring out its tiny details. These have a 1.2mm Inside Diameter closed ring which will accommodate an 18 gauge or thinner jump ring. Create some Charming Earrings that your Customers will truly Enjoy with our Sterling Silver Earring Findings. These are really really nice. The oxidization and dimension is spot on. The only critique for this piece is most of the top rings are a bit uneven or slightly misshaped on the inside diameter. I typically use the 4mm hard snaps and sometimes I have to reshape the ring for it to fit. Otherwise a great dangle.